A VFD (Variable Frequency Drive) is an electronic device that allows you to manipulate the electricity supply to a device. It should probably be called a VVFD (Variable Voltage and Frequency Drive). Essentially there are 2 things that alter the speed of the motor. The number of stator poles, which is fixed at manufacture, and the frequency of the power supply. In Australia power is supplied at 50 Htz. 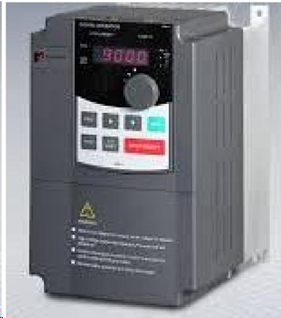 The VFD can modify the frequency and the voltage supplied to the motor. Motors are designed to run on a single phase or a three phase supply. To obtain the power required to run the large impellers used by Clearvue we use a 3 phase motor. Many users do not have a 3 phase system supply in their premises and using a VFD allows us to turn a single phase into a 3 phase supply for that motor. We have investigated many manufacturers of VFDs which are available from many countries and at an enormous range of prices. Powtran have been manufacturing since 1984 and are one of the 5 largest producers in China. Their support and service is excellent and the pricing is highly competitive. We are able to offer their product knowing that they are reliable and efficient. three phase to three phase. We can supply other sizes should you have other motors you wish to control. We can now supply remote controls for use with the Powtran VFD. We will be able to supply these devices for almost any VFD but you will need to give us the details so we can provide correct wiring instructions. Any wiring that is required is on the very low voltage part of the VFD so you do not need to be an electrician to do this. The most comprehensive and top of the range is the RCA 10. The receiver unit which is mounted near to the VFD has a manual operation combined with a lock out switch. This prevents any of the remotes from working whilst the cyclone is being emptied or maintained. 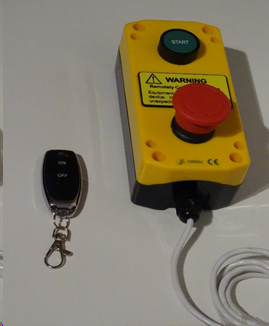 It comes complete with one key fob type remote switch. Extra remotes are available, and the control unit can cope with up to 15 remote devices either key fob type RCKF or fixed RCWTO devices.